Eagle Dancer” and “Feather #1” are stamped in Memories black , colored with watercolor pencils and cut out. A background is prepared on a piece of deckled white card stock which is colored with chalks. 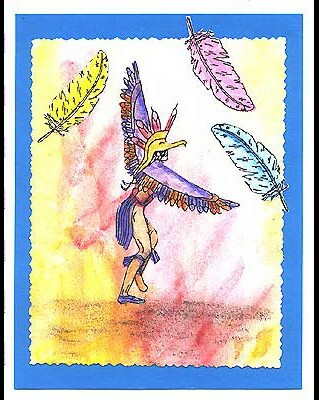 The cut out dancer and feathers are attached to the card after it has been layered on blue and white card stock. Card by Margaret Wiggin.